(Bloomberg Opinion) -- Most of the world probably knows this week's guests on Master in Business, Cameron and Tyler Winklevoss, as the twin brothers at Harvard who clashed with Facebook founder Mark Zuckerberg over ownership of the social network. That's a dispute they lost, but they have gone on to make a mark, mainly as early crypto investors. The Winklevii, as they were called in the film "The Social Network," didn't exactly come off well in that dramatized version of events. They sued Zuckerberg for fraud, accusing him of stealing their idea; in 2008, they settled for 1.2 million Facebook shares, worth about $300 million in the company's 2012 initial public offering. They rolled the cash into Winklevoss Capital in 2012, to invest across multiple asset classes with an emphasis on seed funding and early-stage startups. They were early investors in Bitcoin; their 1 percent stake in the cryptocurrency at its peak in 2017 was worth more than $1 billion. It isn’t exactly a rags-to-riches story. They tell of being born into an entrepreneurial and competitive family. 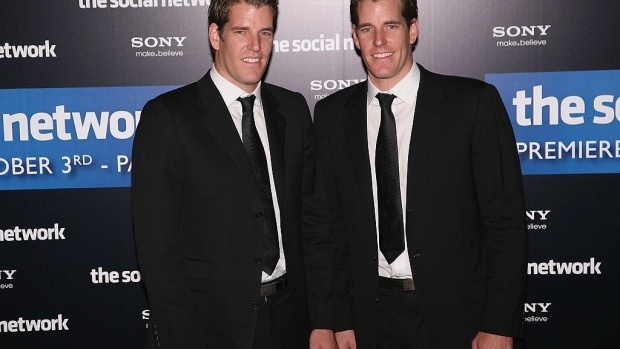 The two competed in the men’s pair rowing event at the 2008 Beijing Olympics; their father, Howard Winklevoss, is an entrepreneur, author and former adjunct professor of insurance at the Wharton School of the University of Pennsylvania. You can stream/download the full conversation, including the podcast extras on iTunes, Bloomberg, Overcast and Stitcher. Our earlier podcasts can all be found at iTunes, Stitcher, Overcast and Bloomberg. Next week, we speak with William J. Bernstein, neurologist and co-founder of the investment management firm Efficient Frontier Advisors. Bernstein has written several books on finance and economic history, including "A Splendid Exchange." He was the 2017 winner of the James R. Vertin Award from CFA Institute.